So in case you didn't know...New Years is my favorite holiday. I stayed in Haiti for Christmas because I wanted to be with Odessa and it was a great day. I like Christmas but I LOVE New Years. Something about the new beginnings and looking forward to all the things in the year to come. Normally, I'm a homebody but on New Years I like to go out. Get dressed up. Celebrate. And the countdown. I am a bit tachycardic just thinking about it. So I was more bummed about being here on New Years than Christmas. The town I live in here has a few restaurants and nightclubs that the UN soldiers frequent and I thought about going and hanging out with some of them. Then, the Sunday before the youth group at the church in Peredo came and asked me to help with the Church New Years party. So we had a meeting and I soon figured out why I was invited...they had no money. They needed a generator (no electricity yet in the village), a projector to show movies/videos, speakers, decorations, food, etc-you get the point. I'm the white girl so I must have money...right? Well long story short I did pitch in money and used the expense account to buy the gas for the generator and borrowed a projector from another mission and borrowed the speakers from my friend, David. But they also pitched in their own money. I was so proud of them. And it was amazing how easy it became for them to trim the budget once their own money was being spent. Funny how that works. So I went out on Friday afternoon and helped decorate the church with flowers and streamers and balloons. I have to explain the balloons. There is no party supply store here and where they found this assortment I have no idea. There were "Merry Christmas", "Happy Boss's Day", "First Communion", "Lakeview Ambulance Service", and "Happy Birthday" balloons. No exactly the New Years decorations I am used to. I went back home for the evening and returned for the church service at 930pm. We thanked the Lord for the past year and asked Him to bless the year to come. The prayers of thanks included gratitude for the Lord providing food, homes and for all the Americans who came to help work on the camp and clinic the past year. I was humbled when they thanked God for sending Miss Ginny to Peredo. And I thanked God for that too. The last song we sang will stick in my mind this year to come. I listened to them sing the 1st verse until I realized I knew it in English. "I Have Decided to Follow Jesus." Here are the lyrics for those of you who don't know it. As we sang the last 2 lines in Creole, "Mwen pap tounen, Mwen pap tounen." (I won't turn back, I won't turn back) I couldn't help but think of the past year. Good and bad. I planned to come back to Haiti January 19th. The earthquake hit on the 12th. I lost my housing in March and had no where to live in Haiti. During that short time home I got an awesome job offer in the States. I began a long adoption process when people said adoptions would be closed in Haiti for years. 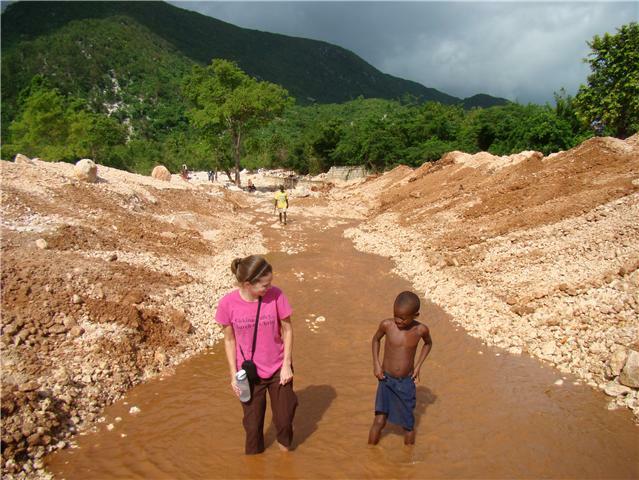 I endured the difficulties of learning to live on my own in Haiti. Rumors flew here on the mission field just as they do everywhere else. I studied Creole like a mad person well enough to teach a class by myself. Promises were broken by Christians and never apologized for. That is all looking at the past year in Haiti. But the beauty of New Years is leaving all that and looking forward. The good and the bad. All these examples were flashing through my mind as we were singing that song. Haitians are know for their loud singing in church. Very loud. But I think in this small village church in Haiti as the New Year was approaching, an American was singing above the other voices. Because I have decided...to follow Jesus. The party started at midnight when church was over and it was packed. So packed I was kinda nervous it might get rowdy but everyone had a great time. There were skits put on by the young people, a Haitian comedy movie shown (apparently I don't have a Haitian sense of humor b/c I didn't get it at all!) and sandwiches and snacks were enjoyed. After a while the mismatched decorations, the hum of the generator and the lack of other white faces faded and I was at yet another great New Years Eve Party-although much different than the years before.